A few months ago a friend of mine sent out a mass email with the sad news that one of our most beloved nail polish shades was now on the toxic no-no list. (R.I.P. Sugar Daddy). It left me questioning, what are some safer alternatives? The eco-friendly-non-toxic polish brands that I'd tried in the past just didn't stand up to their evil twins and left my manicures looking like they were done by a preschooler. After a little research and testing here are our favorite new wave non-toxic lacquers. We found that the majority of top nail brands are now avoiding the "Toxic Trio" DBP, Toluene and Formaldehyde. However, a growing number of companies have extended their list to FIVE and are removing questionable allergens, Formaldehyde Resin and Camphor from ingredients. Our list below includes polishes without these FIVE ingredients or TPHP. The BEST red for classic holiday. It's not too bright or jolly and has a hint of spice that can be enjoyed year round. Fast drying and long wearing with a high gloss finish. This shade was the winner of InStyle magazine's award for Best Beauty Buys 2015. Formulated without parabens, sulfates and not tested on animals. 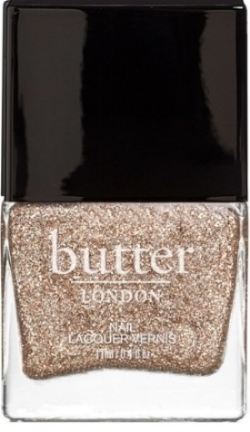 Known for high pigmented shades and their trademark bottle, Butter London is dedicated to give you the color without compromise. Walk the line between gold and silver. Shade 444 is perfect for ringing in a new year and pairs well with champagne. ZOYA is an ultra long-wearing, toxin free nail polish and treatment formula. Perfect for monochromatic chic this winter the "Dove" shade is a soft, delicate light neutral gray with an opaque, glossy creme finish. Taking it all away: One of the more obviously toxic elements to a manicure is the smell of a pungent remover. We found this organic remover on Amazon and are converts. It may be a bit pricey and take longer to remove your color, but it is easy on skin and the lavender scent is an added bonus (available in unscented). Posted on December 21, 2015 by Kimberly Gant and filed under Style Stories, Beauty & Wellness and tagged Nails Lacquer Non-Toxic Manicure Chanel Deborah Lippmann Zoya butter london Winter Nails.